For those people who do not know (or have already forgotten) Constantine was a television variant of the DC Comics Hellblazer, starring one John Constantine, a sarcastic, sardonic, British … dealer in dark arts, more or less. On NBC this past season, Constantine was played by a Matt Ryan. The plots were strange (because, well, why not?) but Ryan managed to carry it with a certain rough charm that makes you think if he were more witty, he’d be Harry Dresden when he grew up. But, as it was on NBC, it died, a horrible, lingering, painful death. It was over in 13 episodes. All changes to resurrect the series were killed. CW didn’t want it. Syfy didn’t want it. No one would come to the rescue. But, apparently, magic and mystical paraphernalia will be a major part of season four of Arrow, so Matt Ryan may be employed more often than they’ve said. Arrow returns from the abyss on October 7. 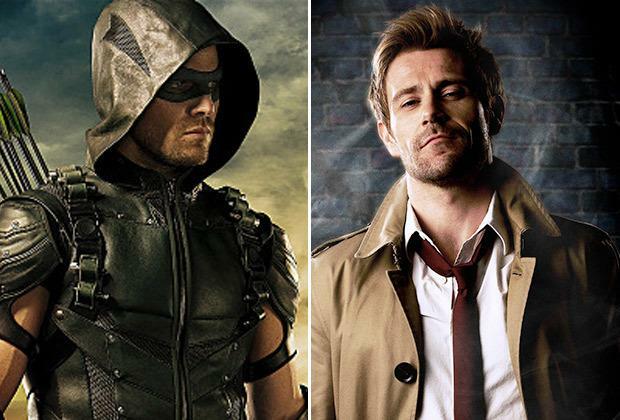 Image | This entry was posted in Fiction, News, Superhero and tagged Arrow, Constantine, DC, DC Comics, Greg Berlanti, John Constantine, Matt Ryan, NBC. Bookmark the permalink.